Mammatus, also known as mammatocumulus (meaning “mammary cloud” or “breast cloud”), is a meteorological term applied to a cellular pattern of pouches hanging underneath the base of a cloud. The name mammatus is derived from the Latin mamma (meaning “udder” or “breast”). True to their ominous appearance, mammatus clouds are often harbingers of a coming storm or other extreme weather system. Typically composed primarily of ice, they can extend for hundreds of miles in each direction and individual formations can remain visibly static for ten to fifteen minutes at a time. While they may appear foreboding they are merely the messengers – appearing around, before or even after severe weather. 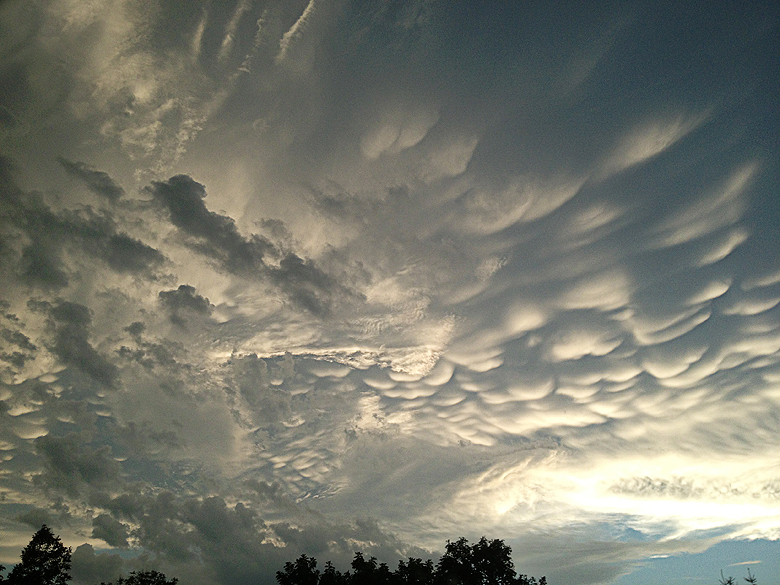 Named for their resemblance to a cow’s underbelly, mammatus clouds sometimes appear at the end of severe thunderstorms when the thundercloud is breaking up. Researchers have called them an “intriguing enigma,” because no one knows exactly how and why they form. The clouds are fairly common but often go unnoticed because potential observers have been chased indoors by the rain. If you are one of them, go back outside when the downpour stops; you could witness a beautiful mystery in the sky. Interesting, thank you. And a beautiful photo. I’ve never seen clouds like this in Scandinavia.